"This anatomically modern human skull (Sergi 1884, plate 1) was found in 1880 at Castenedolo, Italy. The stratum from which it was taken is assigned to the Astian stage of the Pliocene (Oakley 1980, p. 46). 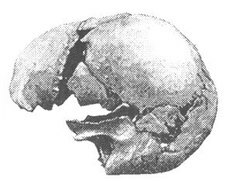 According to modern authorities (Harland et al, 1982, p. 110), the Astian belongs to the Middle Pliocene, wihch would give the skull an age of 3-4 million years. [p. 424, Forbidden Archeology]"